Sales are Rs. 20 cr 25 lakh this quarter ( Previous Year Q1 sales were Rs.3 cr 76 lakh. and there is not much difference in expenses. But Rs 13 cr 09 lakh from Profits have been allocated to rise in Inventories . This is a mere accounting jugglery to hide real profits. 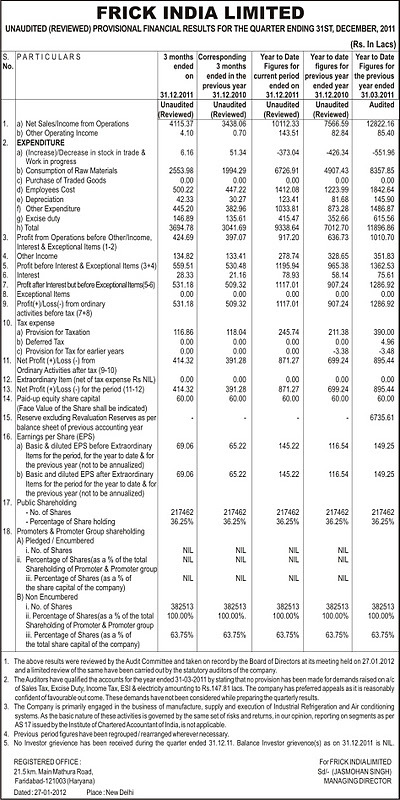 This gives Q1 EPS of Rs.46/47 p . This is Standalone only and does not include the profits of subsidiary companies. It appears ( Please Recheck ) that despite Super Results there would be no dividend for 2016-17. Daily quotation is available at BSE( between Rs 24 and Rs.27 -More of Jobbing Activity )Share is only moderately liquid . Cheminvest is a Holding Company of Max India Limited. There is deep concern about China exploiting , to India's detriment , the current US - Pakistan rift. China props up Pakistan only to weaken India ( String of Pearls policy )India should reduce tensions with Pakistan so that China does not get an opportunist platform vis- a - vis India. Pakistan and India are the two most similar nations in so many ways ( Historically , Culturally , Religion etc. ) Surely friendship is better than enmity. Let Nano cars run in Pakistan . Tata Motors and its shareholders would gain. Pakistanis would get a very good car at a fraction of cost they currently pay. By co-operating with Pakistan India can keep the other Powers out of this Region. We all know that Osama`s body was taken by the US to an Air Craft Carrier for sea burial . But what was a US Aircraft carrier doing in the Arabian Sea. Arabian Sea cannot be allowed to become Persian Gulf. WE ARE BUY BELOW CO. PHYSICAL SHARES. SEND YOUR SELL QTY & SELL RATE. 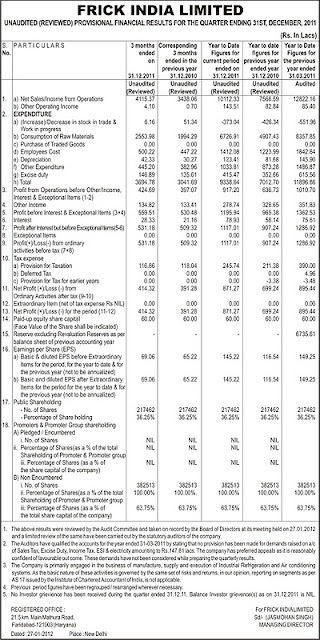 Bharat Nidhi Ltd: I understand that Bharat Nidhi latest Balance sheet is with share holders now. I request expert shareholders to study the Balance sheet and and reveal if there are any encouraging highlights affecting price of this hidden gem adversely or favourably and what is the present fair price of this share in the prevailing market conditions where Highly liquid shares are available at 52 week lows and can rise 100 percent in2 to 3 years. Any social welfare minded persons have answer to these questions as I know that traders will never like to discuss these things in the open forum like this Blog. Thanks to Aswankumarjee for the opportunity provided in this Blog For genuine exchange of information and discussions. May I hope that there would be some who have the ability to answer my posers re Bharat Nidhi.? Have 100 Bharat Nidhi Shares. Selling Price: INR 10,750. Immediate transfer. Please take care IF SOME ONE ASKS YOU TO DIAL #09 or #90. Please Do Not Dial This When Asked. New Trick to Frame Innocent People!! If you receive a phone call on your Mobile from any person saying that they are checking your mobile line, and you have to press #90 or #09 or any other number. they can access your SIM card and make calls at your expense. This information has been confirmed by both Motorola and Nokia. There are over 3 million affected mobile phones. You can check this news at CNN web site also. EPS : Rs.67 / 20 p.
"2010 was another good year for Cadbury India Limited . Our net sales grew by 29 . 4 % over 2009 and our profit before tax grew by 6 . 4 %.
" The robust growth was fuelled by superior product innovation and sustained investment behind our power brands ---- "
EPS is Rs. 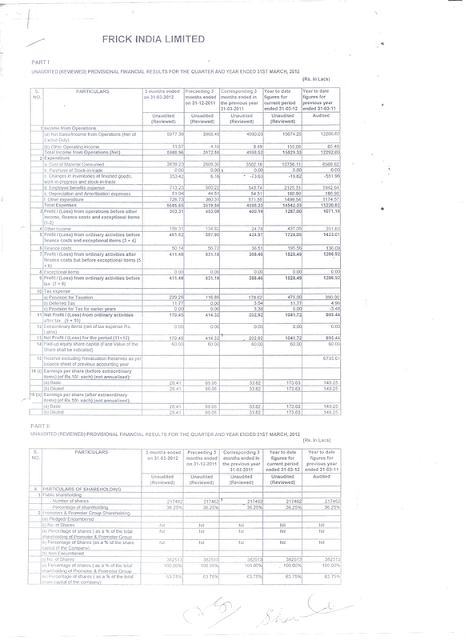 67 / 20 .Cadbury India Limited 's Peer Nestle India quotes ( in a depressed Share Market ) at PE of 46 . This PE ratio puts the Market value of one share of Cadbury India Limited at Rs. 3100 /- per share. Considering that it is a Compulsory Back back and the positive re rating of Cadbury India Limited because of Krafts Foods Brands like Tang , the Buy back should be at Rs. 4500 /- + per share. There are around 8,159 remaining non promoter shareholders who together own 2.42% stake in Cadbury India. Frick India Limited as on 31-03-11 has a Share Capital of Rs. 60 lakh ( Rs. 10 paid up shares ) and Reserves of Rs. 6736 lakh , giving it a Book Value of around Rs. 1133 per share. Frick India Limited has Rs. 1733 Lakh in Investments ( mainly mutual funds ) and its Net Currents Assets ( i.e. Current Assets minus Current Liabilities ) stand at Rs. 5112 lakh. The Company is continuing to upgrade its Design and Engineering Department in order to be in a position to undertake Malls , Naval and Office Air - Conditioning and Ventilation Jobs. Net Profit 8 : 71 Cr. In case the readers want the full copy of the Annual report, please send me a request.